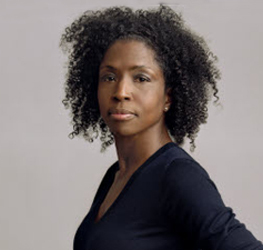 Lorna Simpson was born in 1960 in Brooklyn, New York, and received her BFA in Photography from the School of Visual Arts, New York, and her MFA from the University of California, San Diego. When Simpson emerged from the graduate program at San Diego in 1985, she was already considered a pioneer of conceptual photography. Feeling a strong need to re-examine and re-define photographic practice for contemporary relevance, Simpson was producing work that engaged the conceptual vocabulary of the time by creating exquisitely crafted documents that are as clean and spare as the closed, cyclic systems of meaning they produce. Her initial body of work alone helped to incite a significant shift in the view of the photographic art’s transience and malleability. Lorna Simpson first became well-known in the mid-1980s for her large-scale photograph-and-text works that confront and challenge narrow, conventional views of gender, identity, culture, history and memory. 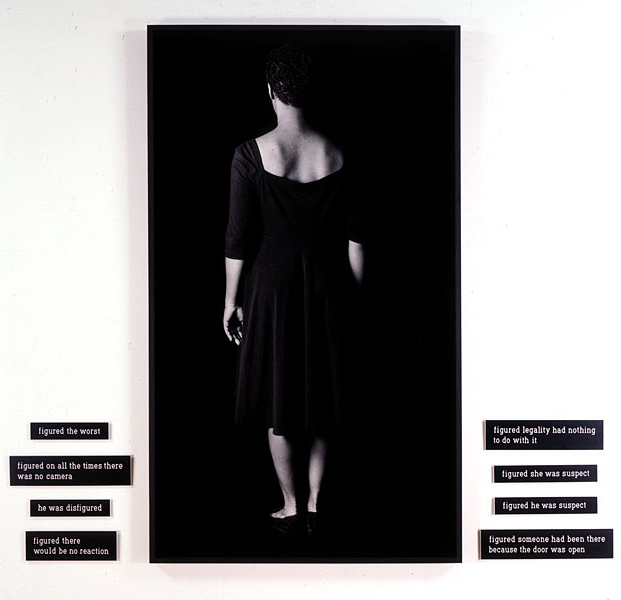 With the African-American woman as a visual point of departure, Simpson uses the figure to examine the ways in which gender and culture shape the interactions, relationships and experiences of our lives in contemporary multi-racial America. In the mid- 1990s, she began creating large multi-panel photographs printed on felt that depict the sites of public – yet unseen – sexual encounters. More recently, she has turned to moving images – in film and video works such as Call Waiting, Simpson presents individuals engaged in intimate and enigmatic yet elliptical conversations that elude easy interpretation but seem to address the mysteries of both identity and desire. Over the past five years, her work includes drawings based on the characters in a recent video work constructed from found film footage. As a collection, these portraits become studies on the construction of identity achieved through the subtle interplay of lines and accents of color. Most recently, she began a project involving an archive of photographs from the 1950s, which she has been adding to by creating her own replicas of these images, posing herself to mimic the originals. Her work has been exhibited at the Museum of Modern Art, New York; the Museum of Contemporary Art, Chicago; the Miami Art Museum; the Walker Art Center, Minneapolis; and the Irish Museum of Modern Art, Dublin. She has participated in such important international exhibitions as the Hugo Boss Prize at the Guggenheim Museum, New York, and Documenta XI in Kassel, Germany. She has been the subject of numerous articles, catalogue essays, and a monograph published by Phaidon Press. Simpson’s first mid-career survey was exhibited at the Los Angeles Museum of Contemporary Art, the Miami Museum of Art, the Whitney Museum of American Art, the Kalamazoo Institute of Art, and the Gibbes Museum in South Carolina. Of late, she had a solo exhibition at Salon94, New York, in 2008 and a solo exhibition at Obadia Galerie, Paris, in 2009. In 2010, she is the recipient of the International Center of Photography’s Infinity Award in Art.